A clowder of cats, a pack of dogs, a herd of alpacas, a school of fish. 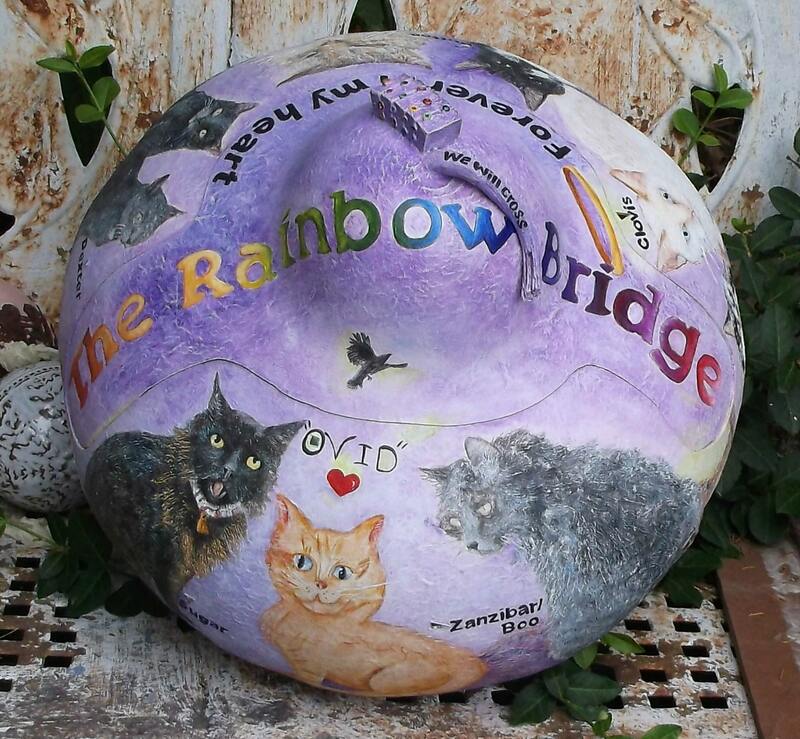 If your beloved pets are numerous, a single large gourd memorial urn ensures togetherness forever. 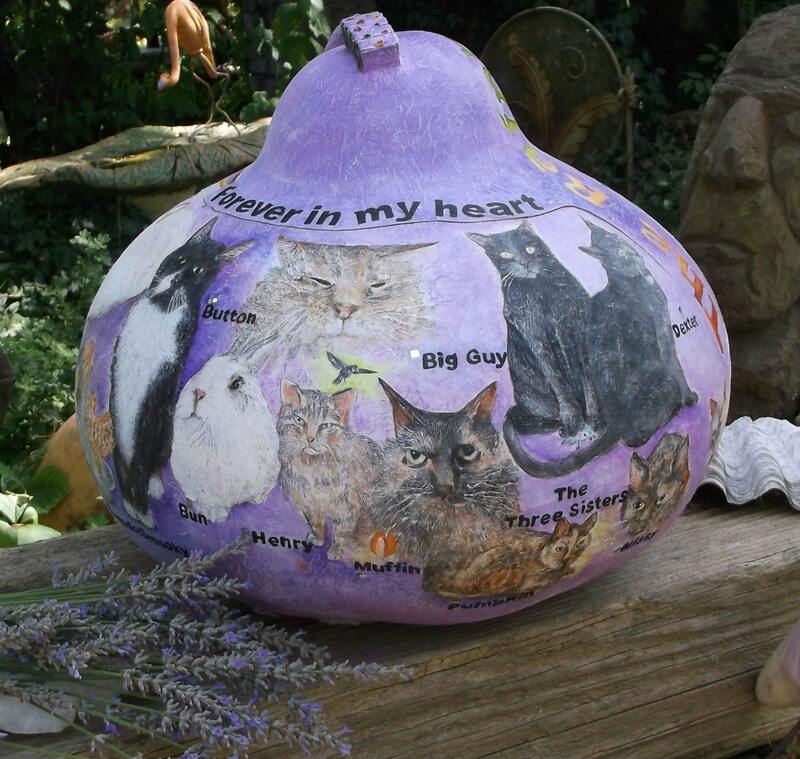 The pictured gourd features 16 separate cat images, and a single bunny. 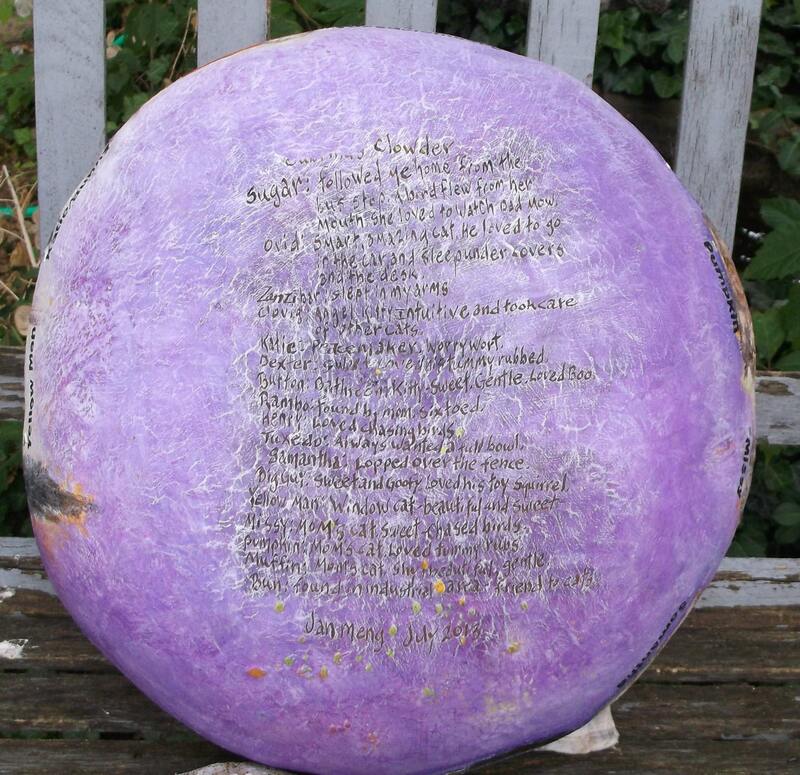 This gourd is about 15 inches across, 51" in circumference and 15 inches tall, more than sufficient to contain the ashes of all, plus collars, toys and other mementos. Through convos, the patron provided photos and stories and some color preference, then gave me creative freedom, and time to work. This piece took a little over nine weeks from first query to finished art. Your artful memorial may take less time or longer. Each cat and the bunny is identified by name. A mirror fragment is inlaid by each name and ambient light produces a bit sparkle. 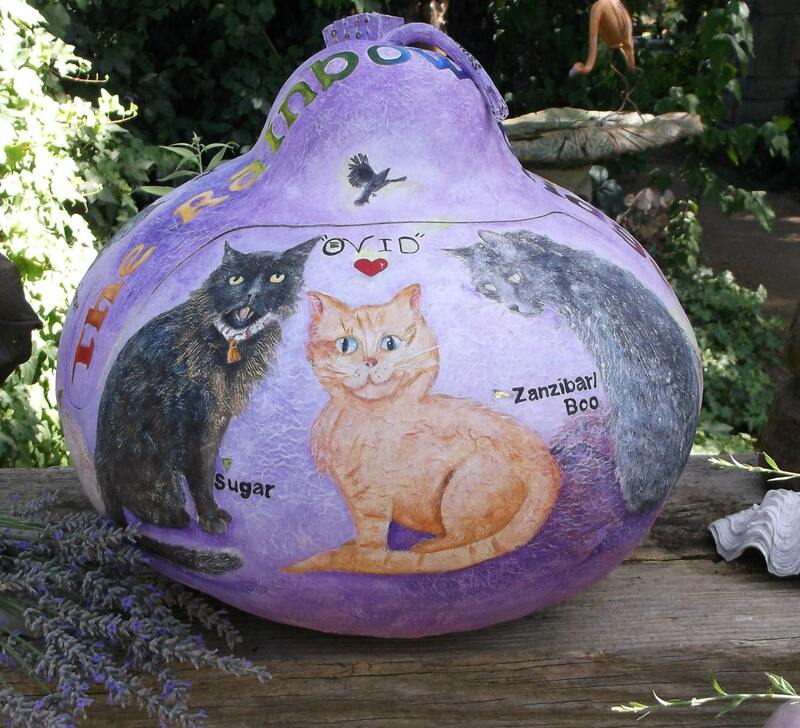 I carved a few sentences about each animal on the bottom of the gourd. The cartoon cat was reproduced from a drawing made by the patron many years ago. Old newspaper type blocks were used to spell out the word: AGAPE, meaningful to the patron. The letters are backwards as is the nature of type blocks. 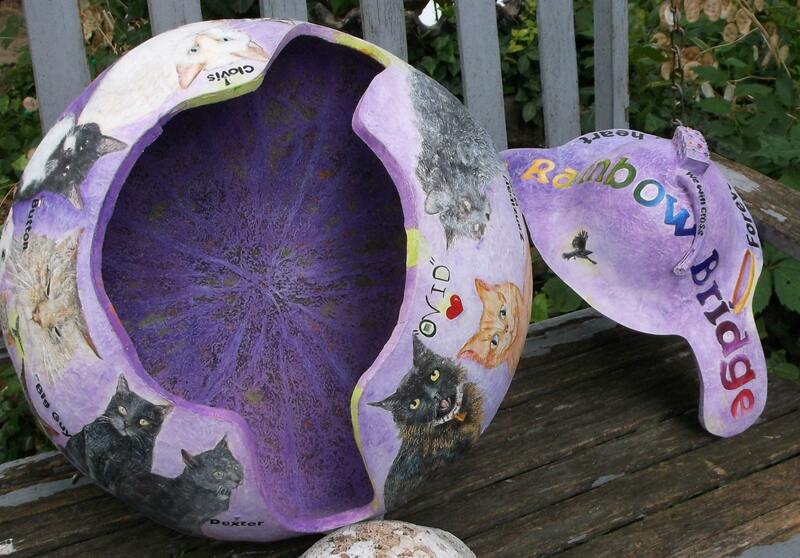 My memorial urns are important to me and I take great care in creating them. Your needs may be met with a smaller gourd. Or a larger gourd. Please convo me for personalized pricing. Small portraits can start at $75. Thank you.